Contemporary depiction of the 1712 rebellion. The British takeover of New Amsterdam in 1664 brought several changes to the growing port city, and one of them was an increased, more brutal practice of slavery. On April 7, 1712, nearly two dozen slaves rose up in defiance, torching houses and taking to the streets to foment a larger rebellion. This early American revolution was put down, but not before sending shockwaves through the young city. While slavery had been permitted under the Dutch, it was, according to Gotham, “a marginal feature of the economy,” and a small free black community had lived there from the colony’s earliest days. By 1712, however, more than 1000 of New York’s 6400 residents were enslaved blacks, mostly from the West Indies. On the night of April 7, 23 black men set out in the night on Maiden Lane. They torched the house of a slave owner, and stabbed the fleeing victims of the fire. Over the course of the night they killed eight white people, and wounded a dozen more. ** The governor sounded a cannon to raise a militia, but the rebels scattered to the woods. They were all captured the next morning, except for six, who committed suicide rather than face trial. Suicide may have been prudent, as the executions were the most grisly form of torture – slowly being burned alive, dragged through town by horses, suspended by chains until death by dehydration, or mutilated on “the wheel”, a process by which a man is rotated on a wheel and slammed with a sledgehammer on every part of his body. All 21 of the executed, which included four alleged co-conspirators, had their heads left on stakes in the middle of town for weeks afterwards. The consequences of the rebellion for other blacks were also severe. The one source of formal black education, a Frenchman’s School for Negroes, was shuttered. Marriages between slaves was banned, as was group socializing. The taxes associated with freeing a slave were made prohibitive. Even free blacks lost the right to own land or carry guns. 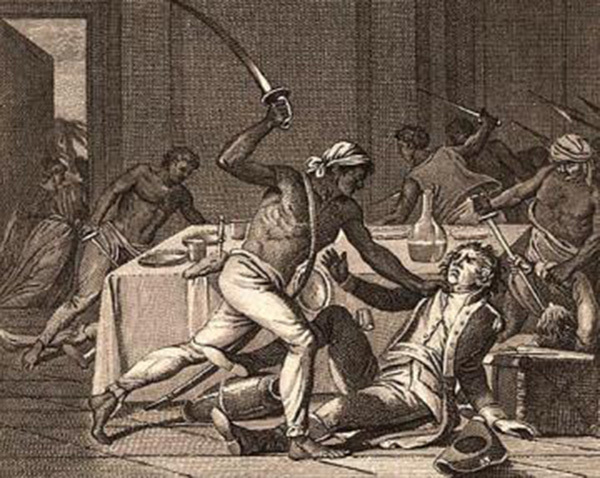 Much to slave owners’ frustration, however, they never fully succeeded in stopping blacks, free and enslaved, from congregating socially, and it was this social energy that led to a second revolt in 1741. **Details of the 1712 rebellion vary by account. Some accounts actually have the revolt taking place on April 6, though Epic of New York dates it to April 7. April 7, 2015 in Today in NYC History.